Previous to this I personally, had yet to hear of this interesting woman called Katchie Ananda. However since the beginning of the Conference I had noticed her name come up in a lot of conversations, I saw students carrying around copies of her book – I even heard her being referenced and quoted by other teachers during their workshops. This intrigued me. So with a little research of my own and I felt drawn, and admittedly curious to explore her style, rhythm and vibrations. In case your also a little new to Katchie here is a very brief description about her extensive experience and vast accomplishments. She is an International Dharma and Yoga Teacher with a certified background in Anusara, Jivamukti, Integral, Ashtanga and spent many years of practice with Buddhist teacher, author and friend Jack Kornfield. 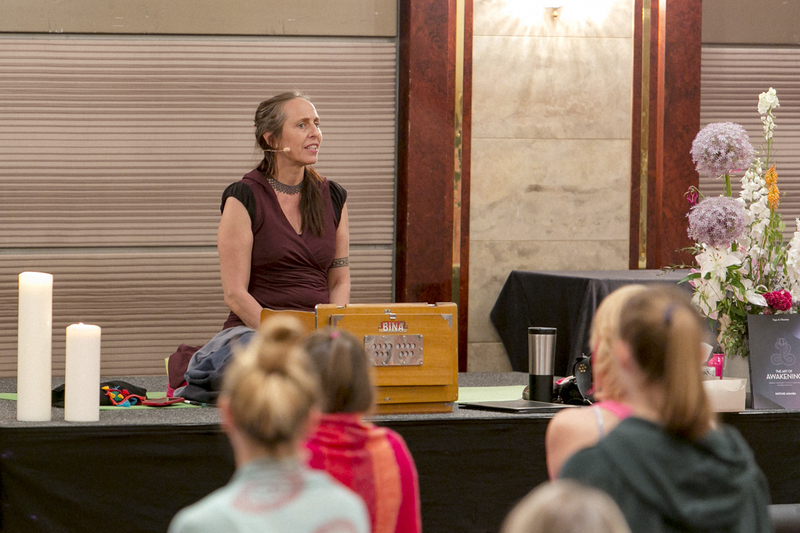 Katchie has spent the better part of 25 years, her life’s work, to explore the practices of yoga and dharma and to share their pathway to freedom with others. It was Katchie last Workshop of the conference, and the crowds were certainly filling the room for this, clearly the first sign letting me know I was in for something special. As I find a space for my mat, I can see people showering Katchie on the stage with love and admiration, she is brimming from ear to ear with happiness and positive energy exuding into the room. The workshop begins with Katchie giving us the cold hard truth, telling us to not take things so seriously- in life or in our practice. To take it with a sense of humour, to see through whats underneath, be ready to let things go and welcome what is coming. It was a great introduction that directly ties into the theme of this years conference, be the change, and speaks to us all. „You don’t have to get rid of your Ego. As our physical practice begins, we are reminded that this is the smallest part of all that is the yoga, that all things will pass, so we may as well enjoy it. A reaffirming thought. 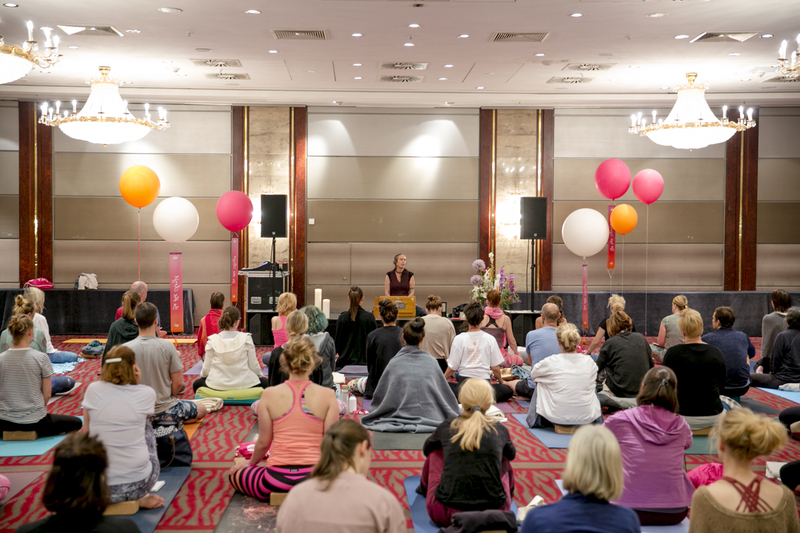 The practice is smooth and slow and purposeful and a little playful. I really enjoyed the guidance from Katchie during the asanas. The constant reminder that you are enough and there is more to it all then just having a fit body, kept lightness and forced you to let laughter out, something not common during my regular practice. I have walked away from todays session carrying now the fruits of my practice with a completely new focus and purpose.